Fishsiam Ltd is an established company dedicated to freshwater fishing in Thailand for some of the largest freshwater fish on the planet. It is a conservation minded company that has captured some of the largest freshwater fish ever caught on rod and line. FishSiam Ltd Thailand is a jointly owned anglo-thai company specializing in bespoke fishing holidays and expeditions. FishSiam has drawn from the local community some of the best homegrown fishing talent there is to be found in Thailand. FishSiam Ltd has combined this wealth of experience, expertise and invaluable local knowledge to create the ultimate in specialist freshwater fishing holidays. The captures of monster freshwater fish made by our clients have been well documented in the International media and have resulted in the Fishsiam team becoming official field testers for Owner hooks in Japan. We are currently field testing various products in the Owner range in our pursuit of the largest freshwater fish on the planet. Whilst fishing for the largest freshwater fish in the world the Fishsiam Ltd team is also provided with the latest big game fishing equipment by our new sponsors Okuma. The Fishsiam team is committed to the use of catch and release methods and is involved in the sharing of information with several conservation orientated groups such as the National Geographic Society, Megafish project Sharktrust and Wildlife Extra. The Fishsiam team has pioneered freshwater fishing on some of Thailand’s wildest and most unexplored tidal rivers and highlighted the awesome Giant Freshwater Stingray on a global stage and has featured in various television documentaries including River Monsters Death Ray with Jeremy Wade on Animal Planet and Giant Stingray with Dr.Zeb Hogan on National Geographic channel. 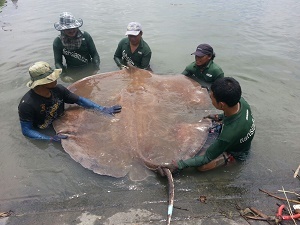 Fishsiam Ltd is currently involved in an ongoing research program endorsed by the Dept of Fisheries in Thailand concerning Giant freshwater stingray. We are currently working closely with Dr.Zeb Hogan from the National Geographic Society and Megafish Project in addition to Dr.N. Chansue from Chulalongkorn University veterinary research team in Bangkok in an effort to monitor Giant Freshwater Stingray population densities in both the Ban Pakong and Maeklong Rivers in Thailand. This ground breaking research will contribute to a greater understanding of the Giant Freshwater Stingray and its movements throughout the great tidal rivers of Thailand. With many years of combined experience, armed with local knowledge and a meeting of Eastern and Western methods FishSiam are in a unique position to offer tailor-made fishing packages to anglers of all skill levels at various locations throughout Thailand. Join our experienced team of guides under the direction of Fishsiam as we take you in search of the world’s largest freshwater fish. such as Mekong Catfish, Giant Siamese Carp, Giant Freshwater Stingray, Arapaima Gigas and a whole host of other freshwater species attaining world record size. Fishing at a stunning variety of destinations ranging from heavily stocked commercial venues, to huge wild windswept reservoirs and vast unexplored tidal rivers all surrounded by some of South East Asia’s most breathtaking scenery and wildlife. The FishSiam team has a proven track record of big fish captures and a diverse selection of venues offering various specialist fishing experiences targeting fish of world record proportions. Fishsiam Ltd Thailand has teamed up with some of the best freshwater fishing guides in the world and will be offering various fishing expeditions to International anglers wishing to fish in other parts of Asia and worldwide for other monster freshwater fish. Fish Siam Ltd caters for all of the visiting angler and their families fishing holiday needs and can deal with all accommodation, travel and entertainment requirements making your holiday a truly memorable experience.